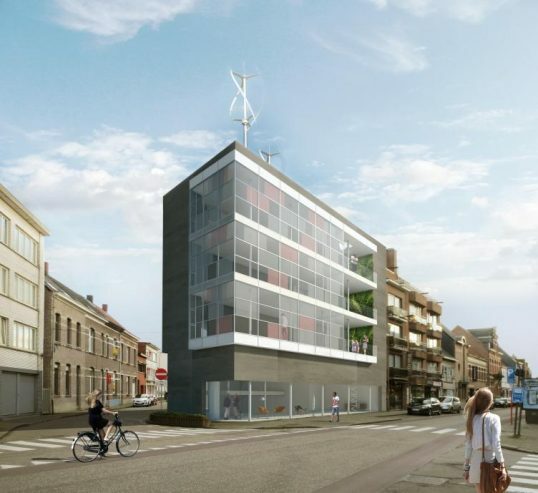 Alinea Rood is an innovative architecture project with a mix of living and working, near the train station and only 750 m from the market in Geel. The showroom and the design studio of Alinea interior architects is situated on the ground floor. There are 3 unique apartments above these with a spacious sun oriented terrace and a large car park space. This “Value Added Architecture” concept, developed by Leo Aerts puts the emphasis on space-experience, acoustics, functionality, comfort and privacy. With respect for the environment, this design offers the necessary quality of life for the future. Of course, this architecture more than meets all future energy standards (B.E.N. standards). The windmills on the roof ensure the necessary energy supply for the entire building. If you would like more information about this project, please feel free to ask for our brochure “Alinea Rood”. Are you interested to become the proud owner of a unique apartment, then make an appointment so that we can explain this project in detail. We are already looking forward to your comments.